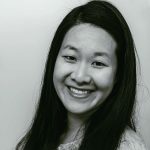 Published Mar 7, 2017 By Julia 36 CommentsThis post may contain affiliate links. 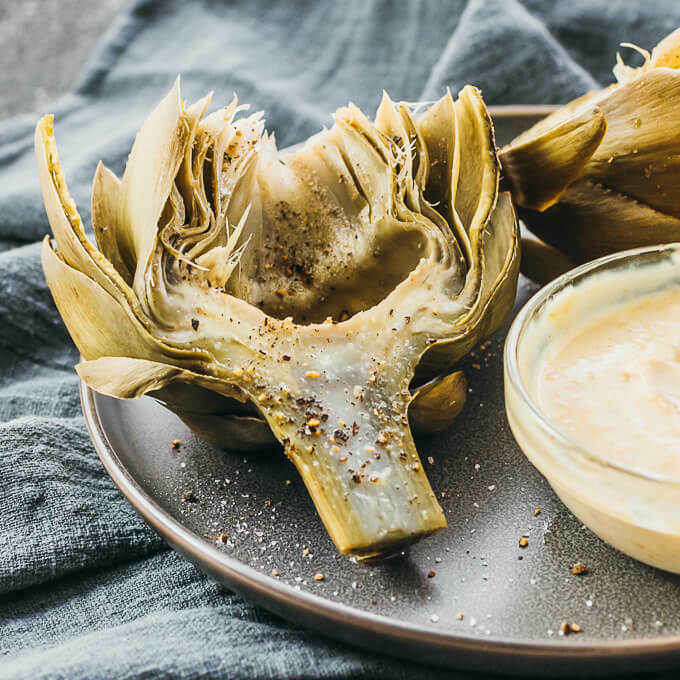 Artichokes are an easy low carb appetizer that you can make in the Instant Pot pressure cooker. I’ve always been obsessed with artichokes — it comes with growing up in California, which produces nearly all of the artichokes eaten in the U.S. — and I almost always order them when I see them on an appetizer menu. 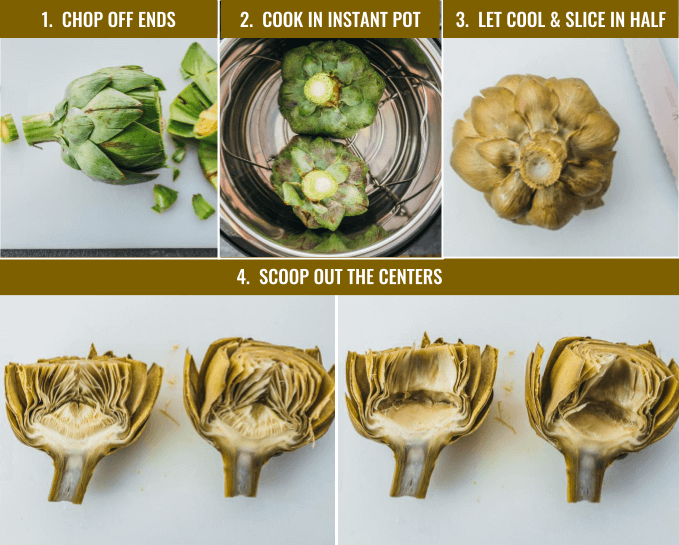 Last year I shared my foolproof method of cooking artichokes so that they’re perfect every time, and a lot of readers chimed in that their favorite method is actually via pressure cooker. Using my Instant Pot‘s steam function, I find that pressure cooked artichokes come out amazingly tender with fall-apart leaves. 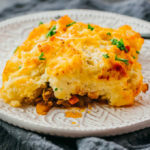 It’s so tender that even the stem is edible, which is not always the case with other cooking methods. 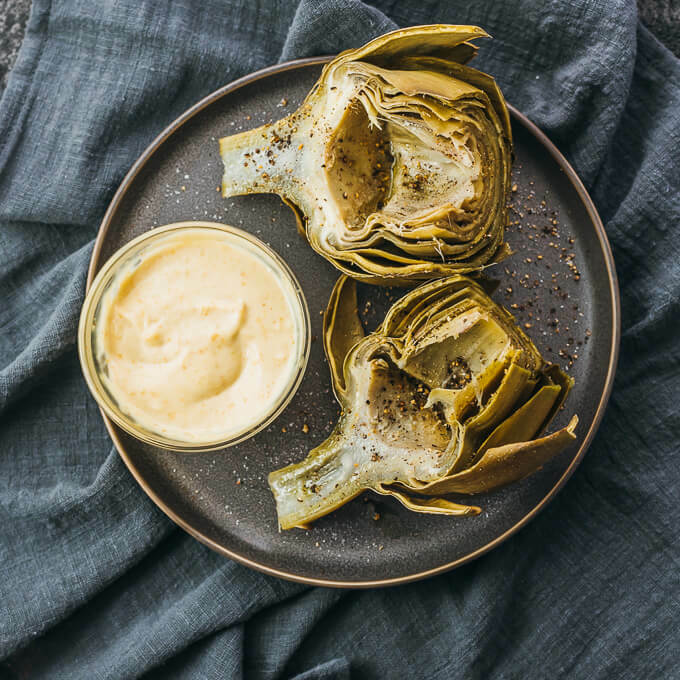 I serve these artichokes with a spicy garlic mustard dip, adding a nice zing to every bite. First, I prepped my artichokes as I usually do: cutting the stem so an inch remains, slicing off the top third of the artichoke, and rinsing it well. I added about 1 1/2 cups water to a 6 quart Instant Pot, so that the water level barely touches the trivet. I used the trivet that came with my Instant Pot, which is a simple metal steam rack that fits the pot. The artichokes only need 10 minutes of pressure cooking followed by a 10-minute natural release. I’ve tested this on both small and large artichokes, and in all cases it resulted in a very tender vegetable. It’s easy to test the doneness of the artichoke: pull off a leaf and it should come off with no resistance at all. You’ll want the artichoke to be very tender — there’s nothing worse than a partially raw artichoke heart. Note that I don’t slice the artichoke in half and remove the centers until after cooking. It’s much easier to do these tasks once the artichoke is super soft, and the centers can be scooped out much more easily. 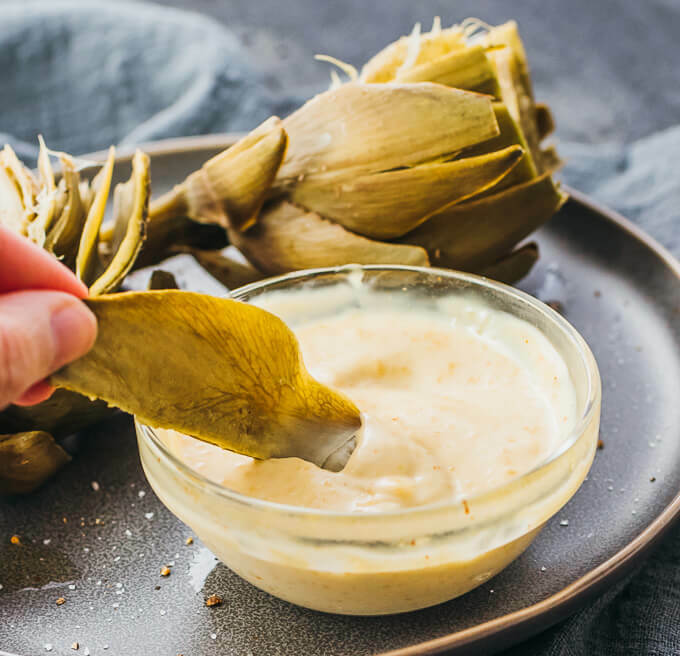 To eat the artichoke, simply pull off one leaf at a time and dip into the sauce, scraping the “meat” off the leaf with your teeth. Check out my post on how to eat artichokes for more details. I really like the artichoke dip here — it’s slightly spicy, a bit mustardy, and has definite hints of garlic in it. 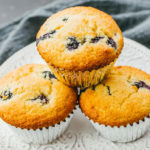 Very delicious, so I highly recommend it, and it only has 4 ingredients. You can find another artichoke dipping recipe here. 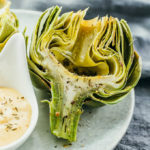 As you make your way towards the center of the artichoke, the leaves will be more tender, so in some cases you might even be able to eat the entire leaf. When you’re finished with all of the leaves, you’ll be left with just the heart and stem, both of which should be completely tender and edible. They’re the best part. Overall, I would rate pressure cooking as slightly better than the boiling method advocated in my previous how to cook artichokes post. 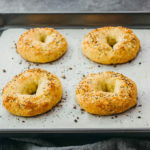 Pressure cooking takes slightly less time (20 minutes for cooking and steam release) than boiling (30 minutes), and it’s nice not having to fuss over a pot of boiling water. However, if you don’t have a pressure cooker or Instant Pot handy, boiling is still going to be your best infallible method. 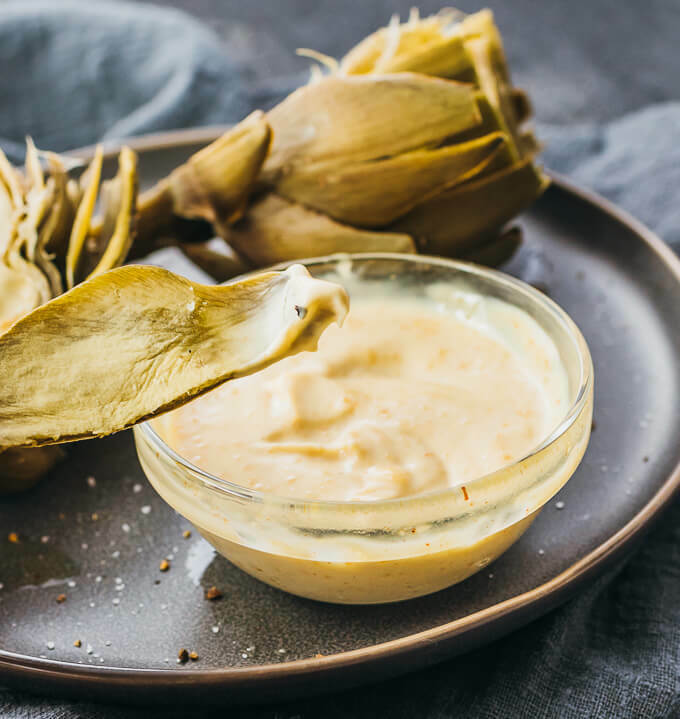 An easy recipe for cooking large artichokes in the Instant Pot pressure cooker, plus a spicy garlic mustard dip. Use a serrated knife to saw off the top third of each artichoke. Cut off some of the stem, leaving about an inch of it. Rinse the artichokes. Place a steam rack or trivet in the pressure cooker. Add enough water so it barely touches the trivet, about 1 1/2 cups. Place the artichokes cut-side down on the trivet. Cover and lock the lid, sealing the vent. Select the steam mode and adjust the cooking time for 10 minutes at high pressure. Let the pressure naturally release for 10 minutes before using the valve to slowly release any remaining pressure. Pull off an artichoke leaf to test doneness; the leaf should come off with no resistance. While waiting for the artichokes to cool, combine and mix all of the dip ingredients until smooth. When the artichokes are cool enough to handle, slice each artichoke in half. Use a spoon to scoop out the choke (fuzzy white and purple centers) and discard. Brush olive oil over each exposed half. Season with pepper and salt. Serve artichokes with the dipping sauce. To eat, peel off a leaf at a time, dip into the sauce, and use your teeth to scrape off the “meat” of the leaf. You can eat the entire tender heart and stem. This recipe yields 6.5 g net carbs per serving (1 artichoke). We LOVE this artichoke dip. Can I put in 4 articokes? That should be fine. Check for doneness after pressure cooking by pulling off a leaf (should come off with no or little resistance) or inserting a knife into the stem (should be effortless). If it’s not done, do another pressure cooking cycle for 5 minutes.